My favourite meal, hands down, is pasta. I would probably eat it almost every night if I could come up with enough ideas. Fortunately/Unfortunately hubster wasn’t raised eating the stuff and will tolerate it only if it’s bloody good. So, since this is a pasta I make on a regular basis I can promise it is bloody good. 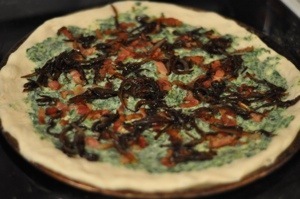 To me it satisfies all the requirements: creamy, flavourful, has vegetables and of course bacon, which makes everything wonderful. This is also a great pasta to add to. 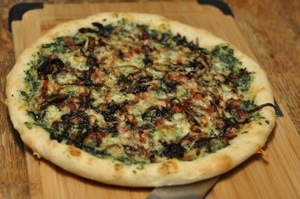 It can completely stand alone and would also be delicious topped with seafood or a grilled chicken breast. I like to think it’s healthy, at least mostly. I used Barilla whole grain pasta for the first time and it was surprisingly good. 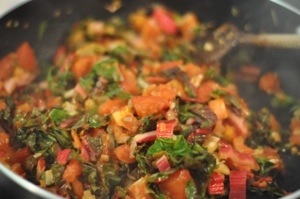 There is lots of fresh chard and tomatoes and only a little bit of bacon per serving. Initially I used whipping cream for the sauce and it tasted fantastic but I can get the same results by using whole milk and cream cheese and reduce the overall calories and fat of the dish without taking away any flavour. I also never have whipping cream on hand and since I don’t like buying things I won’t use, the cream cheese and milk are more practical. It’s definitely not something you should eat every night but I don’t feel a bit guilty eating a huge plate. I find this a great one when I have tomatoes that are starting to go a little squishy. I made this the other day but didn’t even have cream cheese on hand so I came up with a third version. Version one was the fattening reduced whipping cream version that I cannot eat unless I am committed to an hour run, but if you are wanting to try that one just omit any thickeners, cream cheese or milk and use one cup of whipping cream that you allow to cook down and thicken on its own. It will be delicious! 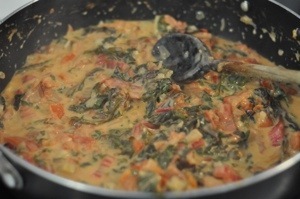 Version three uses flour to thicken the sauce. Same recipe just without the cream cheese. Slice the slices of bacon into 1/4 inch bits and cook over medium heat until crisp. Remove from the pan and set aside on a paper towel. 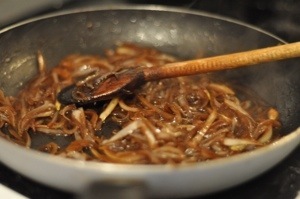 In a large sauté pan over medium heat sweat the onions. Once they have become translucent add the garlic and cook about one minute. 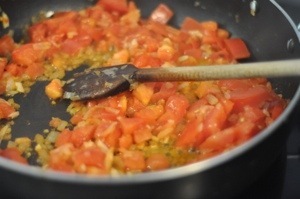 Stir in the tomatoes and continue cooking until they are soft. 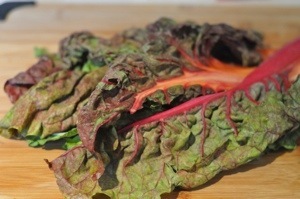 Add the chard and cook until it has wilted down. Reduce the heat to medium low and stir in the milk. Melt in the cream cheese than add the parmesan. Allow the sauce to simmer and reduce down until it can coat the back of a spoon. Combine with the pasta, top with the crispy bacon and serve immediately. Stir in 1 Tbsp of butter or olive oil. Sprinkle the flour over the vegetable mixture and stir until it is completely mixed in. 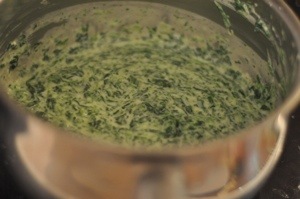 Add the parmesan cheese and serve once the sauce has thickened enough to coat a spoon. 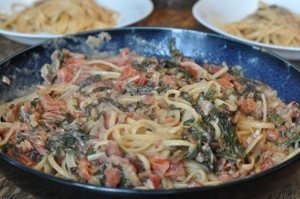 So now you have two ways of using chard and tomatoes in a yummy pasta that kids and parents will all enjoy. I hope this becomes a favourite at your table too and I would love to hear what you thought.